So my roommate and I both love my S’mores Brûlée recipe, (which, by the way, was one of the first posts I made on my blog) so when all the ingredients are sitting on my counter staring me in the face I really can’t get away with not making a batch. Now my original recipe calls for making a ganache, which involves pouring hot cream over chocolate chips to form a thick and rich chocolate sauce/paste. However, this time around I had no cream in my fridge. In fact I had no dairy of any kind. I thought about it for a minute and realized that when I make regular s’mores, the chocolate gets plenty melted when zapped in the microwave, so why couldn’t it work for this recipe? Well, I gave it a shot, and I’m happy to say it works beautifully. The recipe is just as good, but now the most involved step has been eliminated, which makes for happier starving artists. Also time around I had a Cadbury chocolate bar…mmmm. I know Hershey is the all-American favorite, especially when it comes to s’mores, but I’m not gonna lie, I have been and always will be a Cadbury boy. No apologies. As you can see I placed four squares right on top of the graham cracker mixture. I could have actually gotten away with 5 or 6, but it was still amazing. I love mixing up classics like this. Keeps it fun and you can totally wow a dinner party for little money and no time. Sign me up. I’ve posted the revised version of the whole recipe below. Yum! So, remember last week when I posted that recipe for Paula’s Peanut Butter Cake? Well, after the cake was made I found myself with a box of graham crackers and a jar of peanut butter… hmmm what to do. Being summer time I see displays for s’mores supplies everywhere I go – thank you for shoving it in my face, America. But truth be told, I really don’t need my arm twisted to be convinced eating s’mores is a good idea. 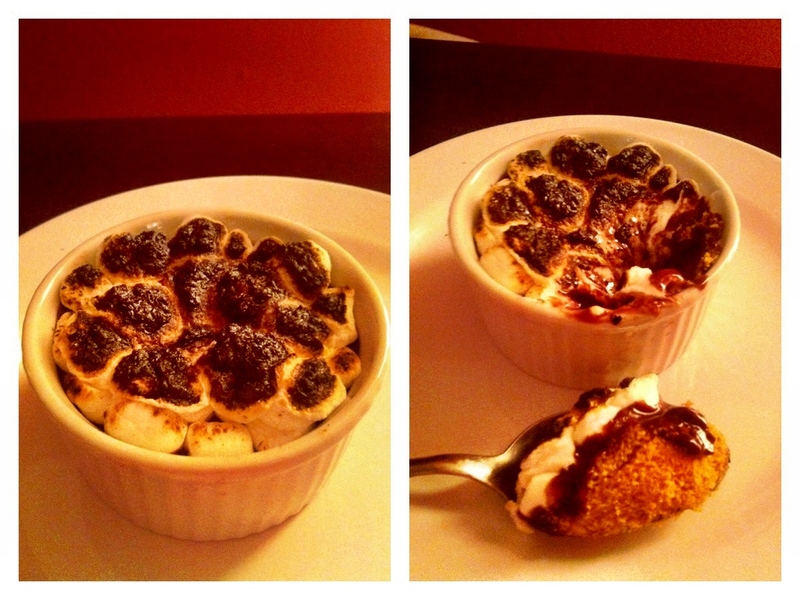 You may recall two of the first recipes I posted on this blog involved s’mores. That being said, it didn’t take long before a bag of marshmallows and a few jumbo-sized Hershey bars suddenly appeared on my counter. Obviously the work of some neighborhood deviant bent on littering apartments with horrible (yet tasty) indulgences. Bastards. But, one must make the best of such situations. Thus, out came my beloved kitchen torch and behold, peanut butter s’mores were made. The version you see in the picture is without chocolate. I did also try it with a single square of Hershey’s and it was divine. 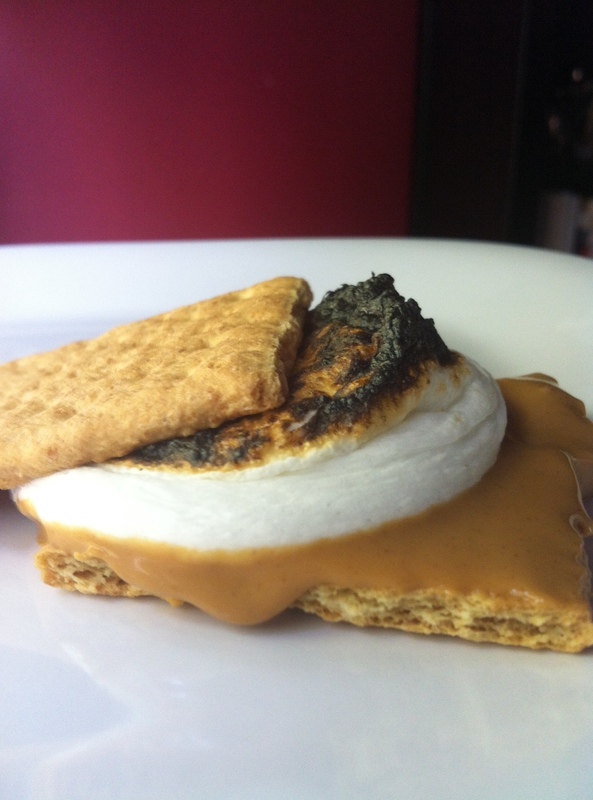 Either way the trick is to spread a thin layer of peanut butter onto the graham cracker, add chocolate if you desire, top with a marshmallow, then microwave it until the marshmallow inflates, about 8 seconds. This ensures all the layers are heated through before you torch your marshmallow. As you can see, I like mine well done, but if you keep your distance you can toast it to a light golden brown. 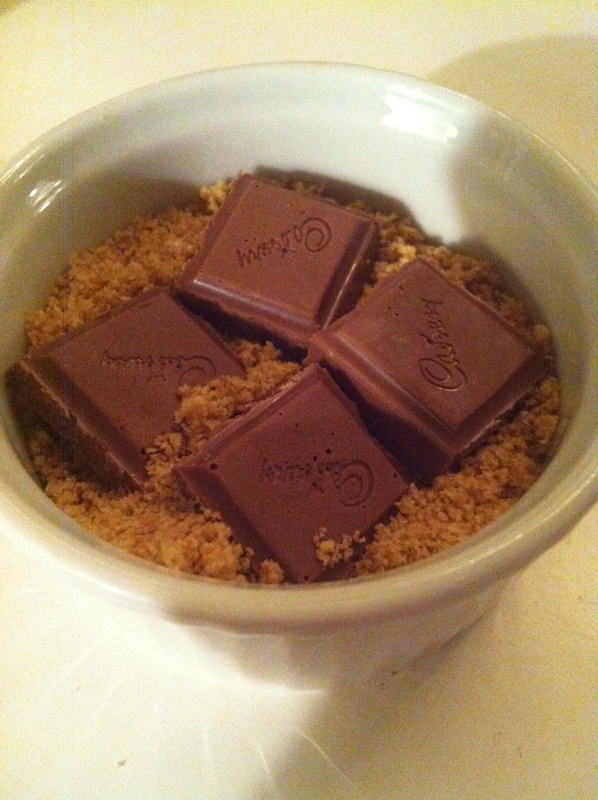 I also just had the idea to do this with nutella instead of peanut butter… sweet god…. I don’t know anyone who doesn’t love crème brûlée. I also don’t know anyone who wants to take the time to make it. Custard? Time consuming. Baking ramekins in a water bath? Please. Instead I’ve come up with a perfect starving artist solution: s’mores. When using my new kitchen torch to make the Peeps s’mores from my last recipe post, I started thinking about crème brûlée and the idea of combining the two hit me. 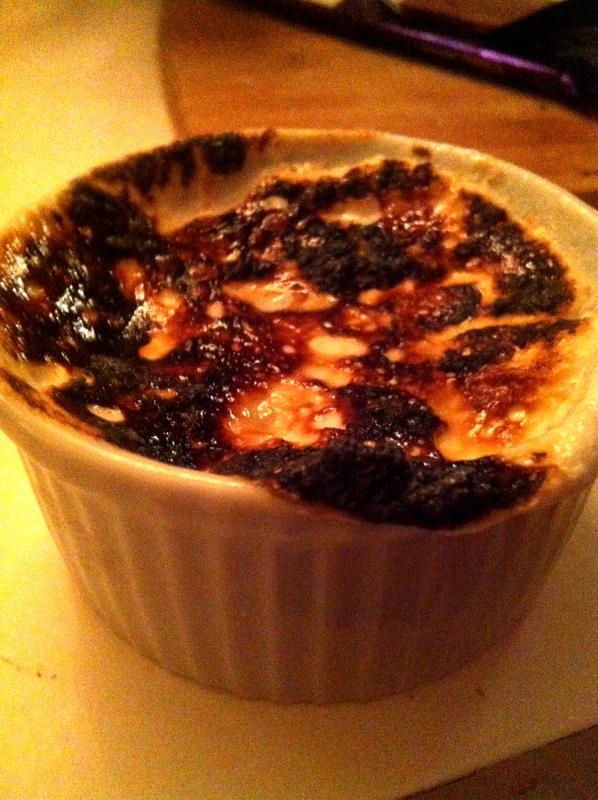 All you have to do is prep the layers, fill the ramekin, and torch it. 10 minutes, no baking, no custard-making, and voila, a delicious and elegant treat that no one will be able to resist. In fact I may or may not have made this every day for the past week. Don’t own any ramekins? Use cereal bowls. Or better yet, double the recipe and make a huge one in a pie plate. Don’t have a kitchen torch? Stash it under your broiler for a minute or two.